Admissions Open for the Academic Year 2019-'20. "At T.I.M.E. 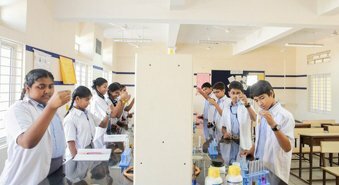 School our approach is guided by traditional values - strong leadership, good teachers, proven teaching methods, comprehensive curriculum and all-round education. T.I.M.E. School brings all these vital ingredients together in a manner that preserves the spirit of education and makes a powerful positive impact on children. The most successful students understand fundamentals and know how to apply them at the right time. We understand that the fundamentals of education and know how is to apply it so that student become confident achievers in all walks of life." Our vision is to impart the highest quality education by providing an inspiring and conducive learning environment that helps bring out the best in every child and helps in the holistic development of the child. Our endeavor is to help nurture talent and create responsible successful socially and environmentally conscious individuals striving for excellence in their chosen fields with a commitment to society. 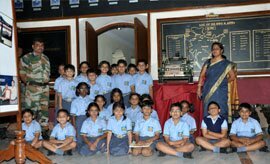 15th August marked a special day with special programmes put up by students and teachers. We had various programmes to commemorate the day and also to re-infuse the feeling of participation in students. Students put up a very enthralling assembly for teacher’s day on 5th Sept. They not only put a very entertaining show but also observed self-teching day with the students acting as teachers. 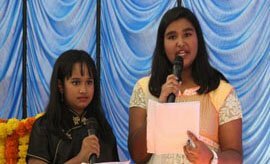 Teacher’s reciprocated with equal enthusiasm on children’s day when they entertained the students with speeches, songs, dances, skit and a fancy dress. 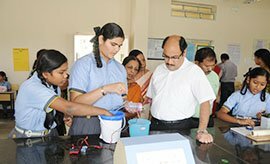 Science exhibition called T.I.M.E. Galaxy was a grand success with maximum participation from students in form of working and non working model was inaugurated by our director Mr.Manek Daruwala and was appreciated by all. The theme was Light'and presentation was unique as everything from literature to science, from maths to social studies the theme was covered. 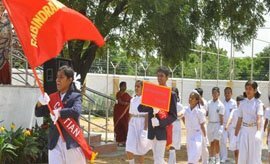 The school celeberated it's Annual day on 23rd Dec with much pomp & fanfare. The theme of the Anuual day was “BOOKS” .Dr K.Ramachary, famous singer, composer, directer graced the occasion as the Chief Guest. The Tiny tots celeberated Grandparents day with the grandparents. WE had many fun activities, bond-building activities with grandparents so that kids feel the warmth and support of their granparents in their lives. 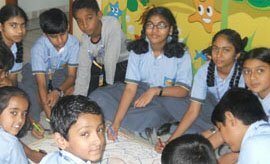 Our students went to Leonia resorts to have fun and enjoy the day out with their friends and teachers. T.I.M.E. School, Bandlaguda congratulates its students on the outstanding achievement in GRADED EXAMINATION IN SPOKEN ENGLISH (GESE) conducted by Trinity College, London. T.I.M.E. School, Kandlakoya congratulates its students on the outstanding achievement in GRADED EXAMINATION IN SPOKEN ENGLISH (GESE) conducted by Trinity College, London. T.I.M.E.School congratulates it's students, staff and parents on the thumping success of it's first batch of class X with 100% results. Our student of class X, S.Varun has come up with a user friendly messenger named as Amego messenger (like Whatsapp) with end to end encryption. It has been accepted by Google and is available in Google Play store. Sreshtha Roy of class X adds feather to our cap continuously by winning medals at National and International level Martial arts competitions. 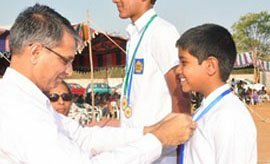 Nikhil Ajay Raghava of class X won Martial arts competition (2 golds) in the tournament held at Gachibowli. Krishna Preetham Kanthi of Class IX won the Entrepreneurship Week 2016 eWeek@School Innovation Award by National Entrepreneurship Network.His project was an "Earthquake detector". S.Aryan of Class X won the third prize in "Made in India Contest" held at Vasavi Engineering college for his project on "Autonomous car". Trinity-39 students from Classes I-X particpated in GESE(Graded examination in spoken English) conducted by Trinity College London.31 students got Distinction and 8 students got Merit. "T.I.M.E. group of institutions has yet again proved their excellence in the field. Both my children are extremely happy with T.I.M.E. School. I have observed that faculty has the development of students as their sole purpose. In todays’ world of hype, we are fortunate to have our children get value based education. While their fundamentals are getting stronger, kids do not seem to be under pressure. They look forward to each new day, for the extra-curricular activities and fun filled learning. Thank you T.I.M.E." T.I.M.E. School opened up its Bandlaguda unit and it wasn’t quite ready, work was in progress but I have taken a chance for my Son. It was hard to think of change but we did it for Yatharth (LKG). He is advancing wonderfully. The staff is top-notch and we have them to thank you for the amazing progress we see in our son day after day. Try it you'll like (love) it. 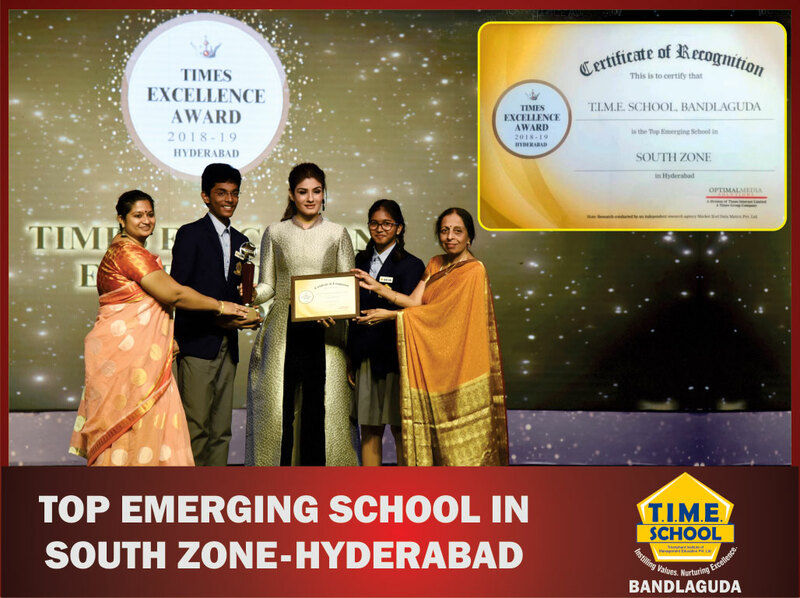 We chose TIME School not only for the personal education for our son but for the administration and staffs ability to recognize each child's learning style and potential. It was, and still is, important for our child to be recognized for his own accomplishments. It was the closest setting of a "typical" school and provided as normal and learning environment as we could hope for. For my kid I found the right school & mentors. They made her transition period easier, joyful and playful. Self confidence was instilled in her because of the right mentors in T.I.M.E. School. I thank each and every one in T.I.M.E. School for honing the best skills in my daughter." T.I.M.E. School is the place I found the perfect blend of values and modern education. Our Principal, Teaching Staff, Support Staff are always willing to lend a helping hand and most importantly are very open to feedback. They are the best and undoubtedly focused on shaping up childrens future and making them a perfect citizens of our country. I am proud that my son got a very good school. I can see remarkable improvement in my sons Academic Results. I should appreciate the T.I.M.E. School management and teachers for their good education systems."